During film winding a high static charge is formed. 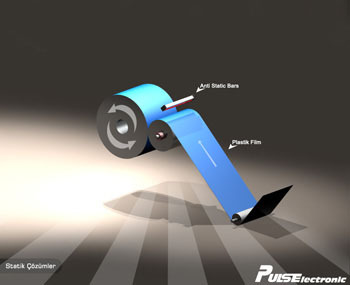 This is an undesired situation leading into various problems such as undesired users shockings, dust collection and the winding not succesfully performed so that a regular production cannot be executed.To prevent such problems an antistatic bar is placed at an angle between the winded roll and material just before the winding process so that th static charge is neutralized. Accordingly a better and clear winding process will be achived.